The day began cold and wet. Not exactly ideal conditions when I needed to get on the road promptly, but it wasn't like I had any other options. After a solid breakfast (thanks again, David and Jean), I threw my panniers to the bike, put on my rain gear, turned on all my bike lights, and was heading north on the A road by 6:45 AM. Thankfully, since it was early Sunday morning, there was almost no traffic. I chugged NW, fighting a headwind in addition to the rain. Thankfully the weather decided to break not long after I made it to the coast and the road turned north. This was the point where I truly realized the depth of my mistake in taking the B road two days before. The A road is infinitely more pleasant and easier to ride. While there are hills, they were usually gentle and weren't the interminable slogs that one finds on the east side of Kintyre. Live and learn, I suppose. It started raining again only a few miles from Kennacraig, which unfortunately meant that I was pretty much soaked by the time I rolled into the ferry terminal. However, that was pretty minor in comparison to the fact that I had managed to ride over 30 miles to reach my destination with time to spare. I rolled my bike onto the ferry, tied it up, and walked upstairs to the observation lounge. I made one mistake at this point, though it was through ignorance more than anything else. It turns out that passengers aren't allowed on the car deck while the ferry is underway. I was so tired that I hadn't gone back down to grab anything else out of my panniers before we left the dock, so I was stuck in wet clothes with nothing to entertain me but my iPhone (with diminishing battery power) for several hours. While it was far from the end of the world, I was definitely kicking myself. There wasn't much to look at after we passed out of sight of the Kintyre peninsula. It was still fairly cloudy, so the water and sky formed an almost uniform bubble around the ferry. After something like an hour and a half, we finally sited the Islay coast. It slid by rapidly and I got my one opportunity to see the Kildalton distilleries from the water. We pulled into Port Ellen right on time and it was a short walk to the Askernish B&B where I would be staying for the next two nights. Joy had been very helpful when I told her I would be getting in early (and likely damp), so my room was ready when I got to the door. I was able to stash my bike in an outbuilding out back, then took a much needed shower before looking for lunch. After a quick bite that the CyberCafe in the local community center, I walked down the road towards Laphroaig, which was only a few miles outside of town. I had originally wanted to do Laphroaig's "Water to Whisky" tour, but the distillery was going to be shut down Monday through Wednesday for a staff retreat, so I had been forced to settle for the standard tour. While it was still cloudy and rather blustery, the walk was actually rather pleasant. I had to keep an eye out for cars coming down the road as there wasn't much of a shoulder, but once again most of the drivers were polite and gave me plenty of space. The southern end of Islay has an austere beauty, as most of the terrain is rock and grass, with only occasional stands of trees. The first sight of Laphroaig is actually their warehouses alongside the main road. In some ways they feel very representative of the distillery itself, with a mix of old and new. The bulk of the distillery is hidden behind a small, neat forest, which opens up to reveal a cluster of whitewashed buildings. It's hard to avoid the sense that Laphroaig is an industrial site. While the kiln's pagodas provide a quaint touch, the newer buildings are all business. I had arrived a bit early for my tour, so I wandered around the distillery grounds and peeked into the visitor center. The small group clustered around as Danielle began our tour. We began with the malt barns, where Laphroaig malts ~20% of the total barley they use, with the balance coming from Port Ellen. After germinating the barley, it is smoked for 20 hours, consuming 2 tons of peat in the process, to a final phenol content of 40 PPM. The peat needs to be damp, but not wet, to produce smoke instead of fire - peat used for heating tends to be bone dry, so it burns much more cleanly. We learned that peat cut by hand retains more moisture than peat cut mechanically, so Laphroaig sticks to using hand cut peat in their kiln. The remaining hot air used to get the moisture content sufficiently low is cleverly recycled from the waste heat thrown off by the stills. We got to see the inside of their kiln, but they were getting ready to shut down the distillery for a few days, so it wasn't in use. From there we moved to the mash tun and washbacks. 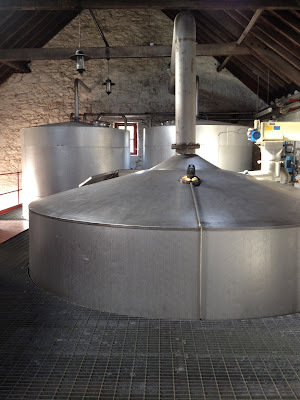 This was quite a turn from the very traditional malt floors and kiln - Laphroaig uses all stainless steel for their mash tun and washbacks, which gives the space a very industrial look. It wasn't always this way, but it is the direction that Laphroaig has moved in over time. Stainless steel was introduced in the 1970s, when the distillery was owed by the English brewer Whitbread. This likely helps to ensure consistency, as steel can be more thoroughly cleaned, meaning that the only microorganisms present during fermentation should be the dried Mauri yeast that Laphroaig now uses. Fermentation is generally short, at 55 hours, producing wort at ~8% ABV, which leans towards getting as much alcohol out of the malt as quickly as possible, in contrast to, say, Springbank. Though for all of that, its yield is almost exactly the same as the other Islay distilleries, despite all the variations in production method between them. We got to try some of the fresh wash which was, to put it mildly, unpalatable. It's essentially very peaty beer, but unclarified, which means that it is also very, very yeasty. Thankfully they don't stop at that point. We stepped across the main courtyard into the stillhouse. 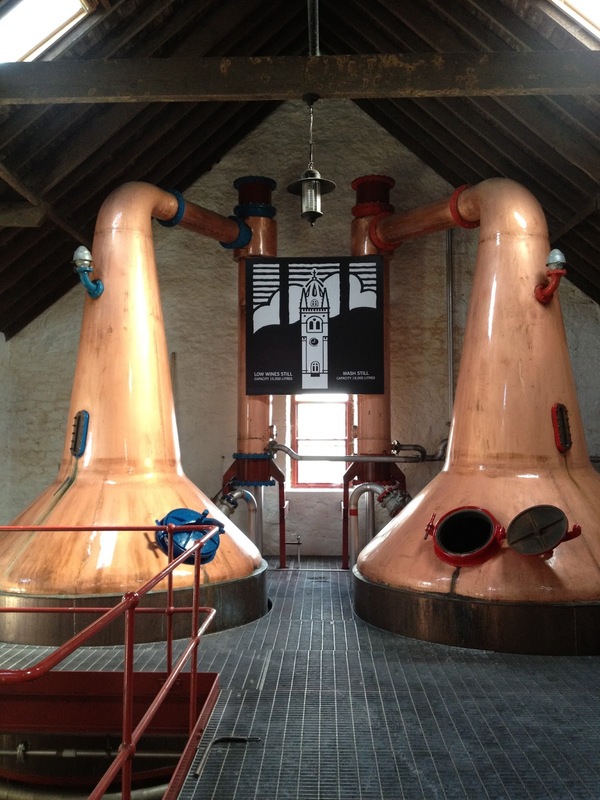 Laphroaig possesses a motley collection of stills - four spirit stills of varying size and three wash stills. 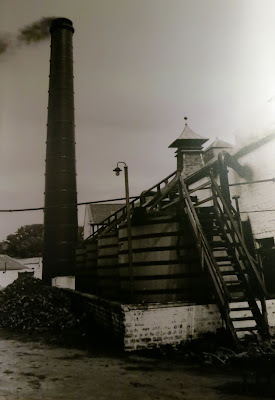 This is because a) the stills were installed at different times as production capacity was expanded and b) the stillhouse is relatively small, which prevented a smaller number of larger stills from being put in. 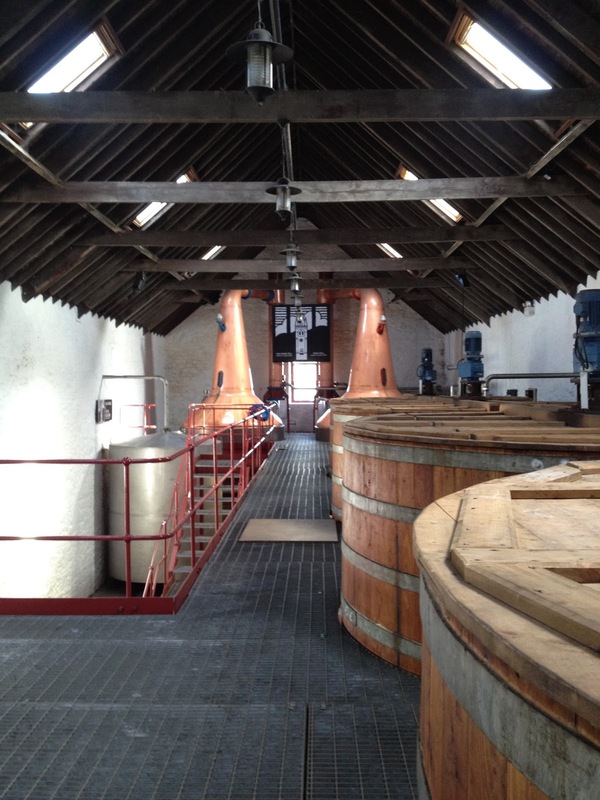 The wash stills are of fairly standard construction, though smaller (10,500 liters) than any other on the island save those of the tiny Kilchoman distillery. They are charged to 83.5% of capacity, which reduces the copper contact, producing a heavier spirit. At the same time, they are relatively tall for their size and the lyne arms rise slightly, which increases reflux and gives a lighter spirit. The low wines are then charged into their spirit stills. These are also very, very tiny considering the output of the distillery, with capacities of 4,700 and 9,400 liters. These are also charged near capacity to reduce copper contact. However, the lamp glass shape, with a narrow throat opening into a wider neck along with the slightly rising lyne arms will all increase reflux, giving a lighter spirit. Laphroaig makes its spirit cuts from 72-62.4%, which leaves out most of the lighter vapors while retaining more of the heavier ones (though not as much as, say, Ardbeg). This gives a very smoke-focused spirit, without some of the lighter fruity compounds that end up in the broad foreshots cut. The new make spirit is then cut down to a standard 63.5% and filled almost exclusively into first-fill bourbon barrels, mostly from Maker's Mark. As Laphroaig is now owned by Fortune Brands, who also own Jim Beam and Maker's Mark, there is always a ready supply of fresh ex-bourbon barrels. That used to be just about it for Laphroaig, though they have now branched out into various cask finishes, such as sherry, quarter casks, and new oak. 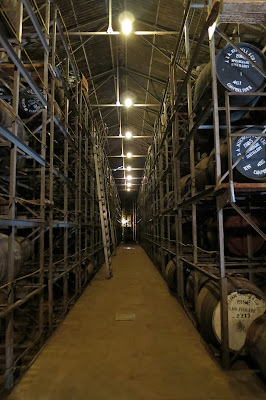 We got to glance inside one of the low-ceilinged dunnage warehouses, but sadly weren't able to go in. After the tour wrapped up we got to sample a number of different Laphroaig single malts. I particularly enjoyed the 10 Year Cask Strength (though unfortunately it's been rather tricky to find a bottle since returning to the States). Considering everything I had seen, Laphroaig seems to be an exercise in tension between past and present. Even looking into their own visitor center, one can see some of the ways that the distillery has changed over time. For a good overview, scroll down for the "Laphroaig, Flavour and Accountants" story on Laphroaig Collector. Currently, the fact that Laphroaig still does some of its own malting is a direct link to the past when the distillery supplied all of its own malt. However, it is also in tension with the future - their own maltings are operating more or less at capacity, yet serve to fill only 20% of their needs. This proportion is already a significant drop from the mid-20th century, when all needs were met in-house. As production has expanded, they have been steadily reducing the ratio and further expansion will require even more dilution. If their floor maltings don't contribute something special to the whisky, why keep them going? Their malt is going to be much more expensive and labor-intensive than what they buy from Port Ellen. Another example would be the shift towards NAS single malts. Laphroaig used to have a rather limited portfolio - the standard 10 Year, a 10 Year Cask Strength, 15 Year and occasional special 25 and 30 Year releases. The 15 Year has since been replaced with an 18 Year, while the rest of the range has been supplemented with an increasing number of NAS malts. It began with the Quarter Cask, which begins life in the usual first-fill bourbon casks, but is then transferred to smaller quarter casks for a short period of time. The result is similar to, but not the same as, the 10 Year and prices are generally on par between the two. Since then a number of other expressions have come out, usually first in duty free shops. The Triple Wood is similar to the QC, but adds an additional layer of sherry cask maturation on top. PX Cask and QA Cask (fresh oak casks) have also made appearances. These are all a significant departure from tradition, as Laphroaig maintained a sort of 'no funny business' policy when it came to wood management for many decades. The current direction seems to be acknowledging the fact that the distillery has limited supplies that it is attempting to stretch via various cask finishes, which allow them to release 'mature' whisky in less time. While this is generally the direction that the industry is taking as a whole, it does significantly change the nature of the spirit Laphroaig is bottling now compared to ten or twenty years ago. With all that said, it's clear that Laphroaig has staked out a solid niche for itself in the whisky world. As others have put it, they're the Marmite of scotch - you either love it or hate it. And those who love it really love it. There really isn't anything else on the market with the same quality of smokiness to it, which is quite intense despite having a lower peating level than Ardbeg (though I'll explain some of why when I talk about touring that distillery). I'll be exploring their malts more in future, to try to get my head around them. My walk back to Port Ellen from the distillery was, if anything, even more pleasant as I was warmed by the smoky drams I had consumed. It was really nice to be able to move at a slower pace, soaking up the landscape and giving myself time to ruminate about the place I had just visited. The smell of peat fires added to the sense of place as I got closer to town, wreathing the place in a warm and pleasant reek. I ended up going to an Indian restaurant in Port Ellen for dinner - one of the residual benefits of empire appears to be decent food from the subcontinent just about everywhere in Scotland. After that I popped into the bar next door to the B&B where I was staying. After peeking at their fairly broad selection of single malts, I settled on the most recent Laphroaig Cairdeas release. Even more enjoyable than the whisky was the company - I ran into several couples who I had met over the course of the day, either on the ferry or at the distillery. I even ended up being introduced to another couple from Portland who were also on Islay to see some of the distilleries. All in all, it was a fun evening and a really nice way to end a long day. It was quite satisfying to crawl into bed, knowing that I had the other two Kildalton distilleries to look forward to the next day. 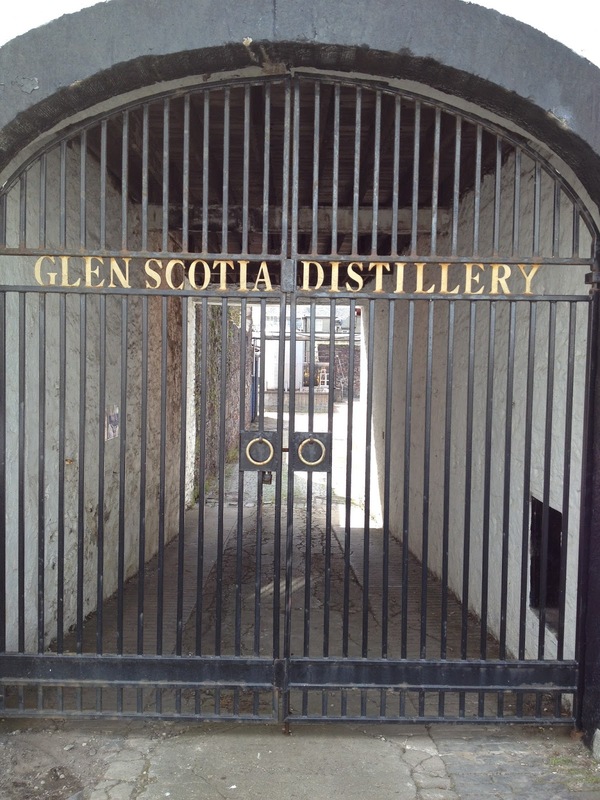 I once again woke up bright and early, because I had a 10 AM tour of Springbank and Glengyle scheduled. Breakfast was another full Scottish affair, which was good since this tour promised to involve more walking than usual. David and Jean were also extremely accommodating when I asked if I could get breakfast at 6 AM the next morning, as I needed to catch the 9:45 AM ferry from Kennacraig to Port Ellen - the next one didn't run until the evening, so I didn't want to miss the morning run. The weather that Saturday was, to put it mildly, gorgeous. Partially cloudy skies with a bit of a breeze kept things pleasantly cool. I poked around town for a bit until wandering over to Springbank, where George greeted me at the front gate. A handful of other guys joined us for the tour, which started in the malt barn. Springbank the only distillery in Scotland that produces 100% of its malt on site - other distilleries with their own malting facilities use at least some commercial malt as well. Water for the malting process, as well as everything else in the distillery, is obtained from the Crosshill Loch, located behind the town. Malt is brought in, soaked with water from the loch, then piled 4-6 inches on the floor. One peculiar feature of Springbank's maltings is that temperature regulation is provided only by windows - this means that very careful attention must be paid to ensure that the malt doesn't get too warm while it germinates. All of the turning is done by hand - the first, but far from the last, element of their production process that is done by hand. However, the distillery was in its quiet season, so we didn't get to the see the malting in process. 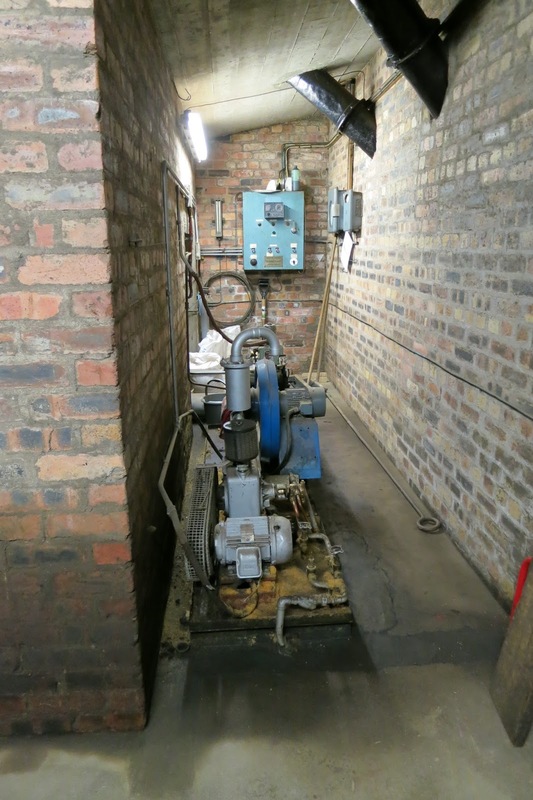 Instead, the space was being cleaned out so that it could be used as a gallery for local artists - one small example of how the distillery seeks to support its community. From there we moved on to the area where they dry their malt to halt germination. Springbank is also unique in that they regularly use three different varieties of malt to produce three different kinds of whisky - Hazelburn is made from unpeated malt, which is dried over 20 hours with what George described as an enormous hair drier, Springbank, which is smoked for 6 hours with peat and an additional 24 hours with hot air to give ~10 PPM phenols in the malt, and Longrow, which is smoked for up to 48 hours (this is an extremely long time, I later found out from visiting other distilleries with maltings) to give ~50 PPM phenols in the malt. From there we passed through the large malt bins to the mill. We finally hit trend status - this was the third distillery I visited with a Porteus mill for grinding their malt. I later learned that there was a good reason for this - some of the mills were nearly a century old, so there was no reason to buy an inferior product. However, this wasn't so good for the company that built them - Porteus went bankrupt some years ago. The mill grinds their malt between two sets of rollers to give a mixture of husks, grist (think grits), and flour. The mixture has to be just right - if the percentage of husks is too low then too much material will flow through after mashing and if the percentage of flour is too high then the mash tends to become sticky and difficult to work with. The next stop was the distillery's (in)famous open-top, cast iron mash tun, one of the last in the industry. They use for waters in their mash, with increasing temperatures each time. The first two extract most of the sugars and are combined and pumped into a washback for fermentation. The third and forth waters pull out the last bits of sugar from the malt and are then recycled as the next mash's first and second waters, respectively. After a quick peek inside to see the wicked-looking rakes, we went next door to the washbacks. These are built from Scandinavian boatskin larch and last about fifty years before they start leaking too much to be useable. Even though we didn't get to see any fermentation in progress, it was still interesting to note the microbial scum floating on the water used to keep the wooden washbacks from leaking - there are plenty of bugs living on and in the wood. There's an ongoing debate in the industry whether those microbes play any part in the flavor of the whisky, as some distilleries replace wooden washbacks with stainless steel. Presumably most of those microbes will be out-competed by the yeast added to the wash for fermentation, but at least some of them are likely to be multiplying and kicking out various compounds that add nuance to the wash and the subsequent whisky. Springbank uses very slow-acting yeast for their fermentations, which take 72-100 hours to reach 4.5-5% ABV. This is very much the 'slow and low' approach to fermentation - it is ~50% longer than most distilleries and about half the ABV. While this reduces the yield per unit of malt, it also means that more secondary flavors are created alongside the alcohol. As an upside, the slow fermentation means that they don't need 'switchers' to prevent the wash from bubbling over the top of the washbacks. After fermentation, the wash is pumped over to the stills. There are a number of features of Springbank's stills that are rare in the industry. First, their wash still is direct-fired (though it also has the now standard steam coils) with an oil burner underneath. This means that the still also needs a rummager - essentially large copper chains on arms that sweep the inside of the still to prevent any residual solids in the wash from burning and sticking to the inside of the still. Direct firing may contribute to the character of Springbank's whisky, because the higher heat of an oil burner produces compounds not produced by the more even heat of a steam coil. Steam gives more consistency, but direct firing produces more complexity. I will defer to Springbank's own diagrams to explain the triple, partial triple, and double distillation procedures that are used to produce Hazelburn, Springbank, and Longrow whiskies. 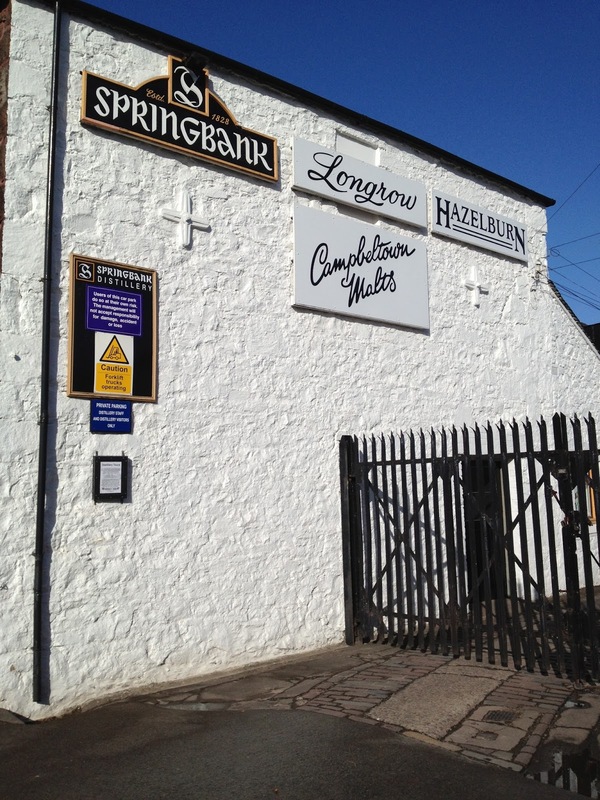 The production schedule - Hazelburn first, then Springbank, and finishing with Longrow - ensures that there is no cross-contamination of their spirits with one another. The phenolic compounds in peat tend to be tenacious, so very thorough cleaning of the equipment is necessary to make sure that none of it ends up in Hazelburn. We exited the stillroom and went to the filling station, where barrels are weighed, filled with new make, then weighed again and marked, so that the rate of evaporation can be checked down the road. We also got to take a look inside both traditional dunnage and newer rack warehouses. 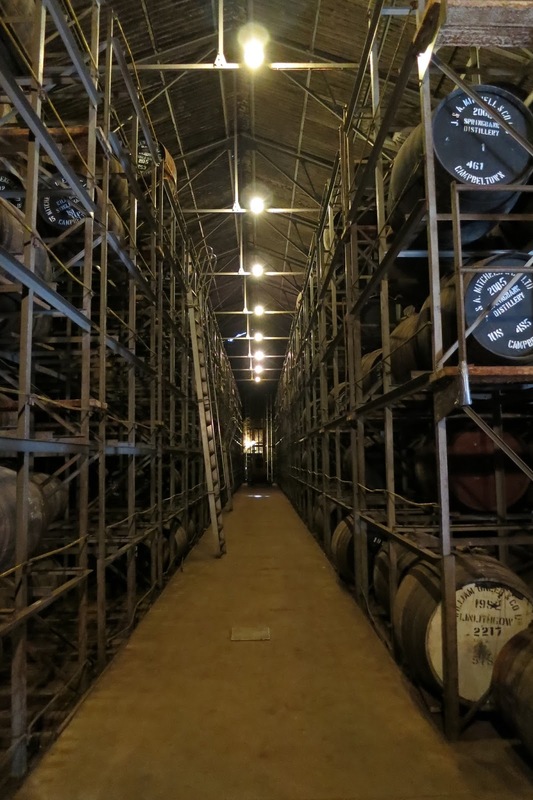 Dunnage has the advantage of consistency - casks are stacked at most three high and the earth floors keep temperatures cool in the summer and warmer in the winter. The downside is that because of the way the barrels are stacked, checking one somewhere in the middle is a huge physical task. Rack warehouses go up between five and seven levels, which means that there is a larger temperature gradient between the bottom and the top of the racks. On the plus side, checking individual casks is a comparatively easy task as each can be popped out of its slot. Fun note, I noticed a few casks of 90s Ardbeg sitting in the warehouses (I'm sure they were positioned there for a reason, but hey). Bet those will fetch a pretty penny when Cadenhead's finally gets around to bottling them. The last part of Springbank we visited was their bottling hall. Once again, the sheer amount of work necessary to put out their whisky became glaringly apparent. Casks have to be rolled in and dumped in a marrying vat, which also limits how much whisky they can bottle at a time. Cases are stapled by hand. The whisky has to be filtered (but not chill filtered). Bottles have to be checked for flaws, filled, labeled, corked, and topped with foil. While there are machines for a few of these processes, they're not automated - someone still has to stand in front and move things along. This is a huge part of why Springbank employes so many more people than the average distillery - everything is done on site and all of it requires a lot of hands. It is another way in which the distillery tries to support the Campbeltown, by creating jobs that keep more of the money in the community, compared to having their whisky transported in bulk for bottling at an automated plant. This definitely adds to the premium that Springbank whiskies command, but it definitely makes me a lot more sympathetic to the distillery. In an industry dominated by large conglomerates that often extract a lot of value out of the area around distilleries while imposing significant costs (wear on roads being a major one) and not giving a lot back, Springbank is a noticeable exception. That wrapped up our tour of Springbank, but there was more to come. Everyone trooped back out into the sun to walk down Glebe Street, formerly the site of a number of Campbeltown distilleries, to the recently refurbished Glengyle distillery. The original distillery was founded in 1872 by William Mitchell, brother of John Mitchell, the co-founder of Springbank. The two had a falling out, which resulted in William starting his own distillery. However, the business had collapsed by the mid-20th century and fell into disrepair, being used for everything from a rifle range to a carpark over the intervening years. In the late 1990s, the Scotch Whisky Association began to rumble about delisting Campbeltown as a distinct whisky region, because there were only two remaining distilleries in the town - Springbank and Glen Scotia. Something needed to be done. The Glengyle buildings were purchased by the owner of Springbank, Hedley Wright, a descendent of the original owners, in 2000. 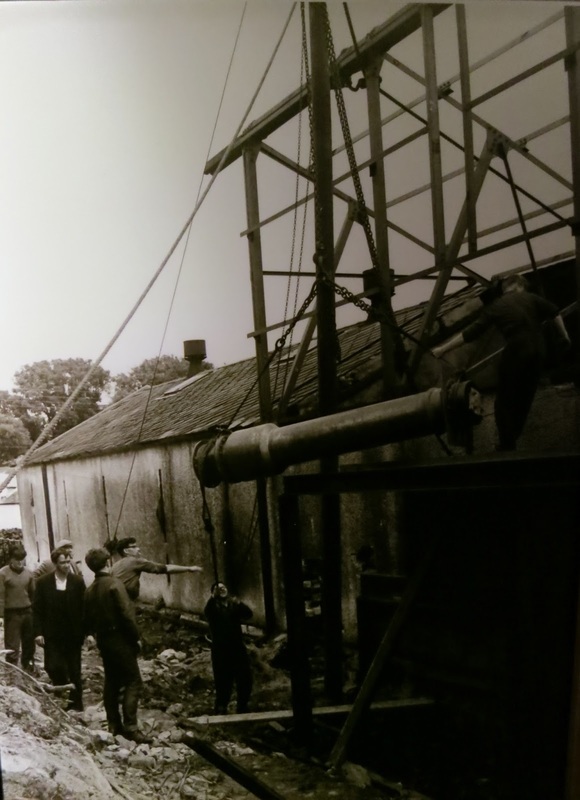 It took four years to fix everything up and install new equipment, including stills salvaged from the defunct Ben Wyvis distillery. While the goal is to eventually have Glengyle be self-sufficient in the same way that Springbank is, with the whole production process being carried out on site, it is still dependent on Springbank for malt (six hours of peat, 30 hours of hot air to give ~15 PPM in the malt) and bottling. Much like Arran, the milling (done with a mill obtained from the Craigellachie distillery), mashing, fermentation, and distillation are all sited on a single floor. 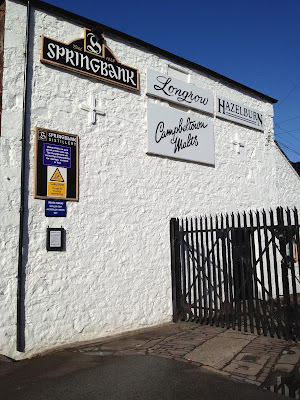 Fermentation and distillation is similar to that of Springbank, with long fermentation times, low ABV wort, and double distillation carried out in roughly the same way as Longrow. This results in a spirit that is similar to, but still distinct from, the three produced by Springbank. As an interesting note, the stills were modified from their original shape and riveted construction to the new shape and soldered construction they now possess. We popped around the back to see the inspiration for the logo of Glengyle's whisky, Kilkerran. The Glengyle name is currently owned by Loch Lomond and used for one of their blended whiskies, so the distillery can't release its whisky under that name. The steeple of a local church is within sight of the distillery and the peak is framed by a small hole in their wall. From the distillery we walked back down Longrow to the Cadenhead's shop. We trooped into the back to taste a number of different whiskies from Springbank and Glengyle. Standouts included the Kilkerran WIP5 Sherry Cask (the Bourbon Cask was somewhat unremarkable) and Longrow Red. We also tried some of the Cadenhead's living casks, which are casks that are regularly topped up with their respective whiskies whenever they drop below half full or so. This means that almost every time you go back they will taste different as new whisky is added to top them off. 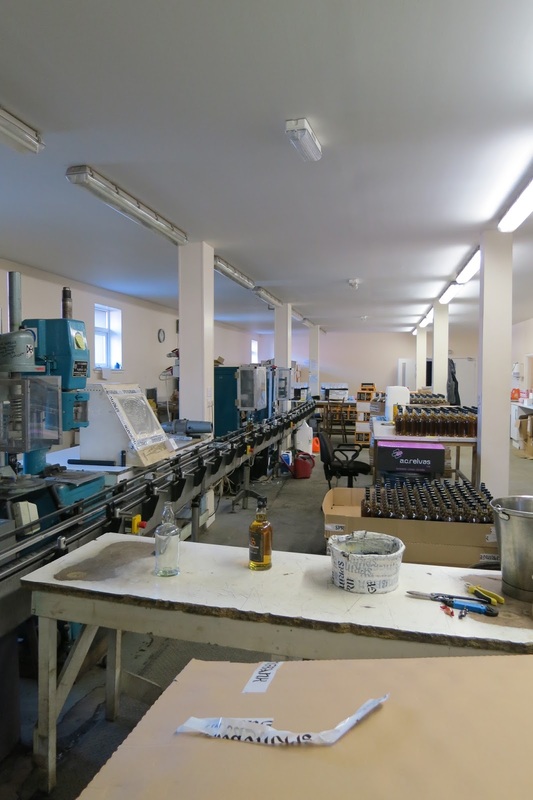 There was also a locked cage containing Cadenhead's 'Duty Paid' samples, which are single bottles from casks that will never be bottled on their own again. This includes fairly standard casks as well as weird one offs like Demerara rum. The upside/downside of this is that there is no way to know what the bottle will be like - no one else has ever tasted it before. Still, it took a supreme act of will not to buy something out of there, but the knowledge that I was at the beginning of my trip and would have to carry anything I purchased around for the rest of my time in Scotland helped. I settled for 200 mL bottles from the Hazelburn living cask and the Campbeltown cask, which is a blend of Hazelburn, Springbank, and Longrow. 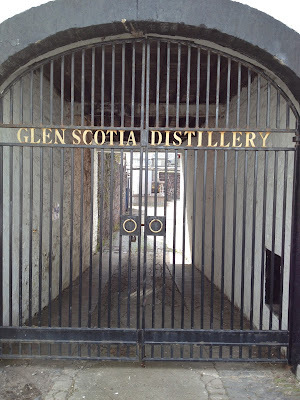 After departing Cadenhead's, I walked around the bay to Glen Scotia, in hopes of getting a tour. Sadly by the time I got there, the one employee who had been present that day had just left after giving a small group of people a tour. So it goes - Glen Scotia is a working distillery, I was there on a Saturday, and they don't have an organized system for giving tours. I was really disappointed after trying their whiskies earlier this year, but it was a sunny day and I had a full afternoon, so I headed back into town to grab some lunch. After refueling, I decided to go for a walk around Crosshill Loch, roughly following this route. I took a slightly more circuitous course through town, but eventually managed to find the path towards the loch, which skirted a number of farms. I walked around the west end of the loch, then headed east and back down towards the bay along the Kilkerran Burn. I ended up at a large cemetery and eventually found the road, which took me north and back into town. It would have been nice to properly hike up Beinn Guilean, but I knew I had an early day coming up and would be working plenty hard to get myself to Islay. After getting back, I more or less crashed, beyond getting dinner. I knew I needed to get up before 6 AM, so I could finish packing, eat breakfast, then get on the road towards Kennacraig. It was going to be a long haul.